Fire officials on Saturday afternoon said the human-caused 25-acre Hiland Road wildfire in Eagle River was completely contained, surrounded by a trench line and tree break that will prevent new blazes from flaring up. "There is a line completely around the 25 acres, and we are confident it won't cross," said Sarah Saarloos, a state Division of Forestry spokeswoman. Officials had said earlier in the day that they're confident the blaze was caused by humans and they're asking people to remain cautious as the state heads into a warm holiday weekend. "It is human-caused and it was along a trail, and so what we really need to get out to the public and to Alaskans as a whole is that it still is very dry and warm; we have the conditions for a fire to spark into a wildland fire at any time," Saarloos said. With two forestry crews attacking the fire on ground and from the air, the blaze had stopped growing shortly after 8 p.m. on Friday. More than 50 firefighters from the Pioneer Peak and Gannett Glacier hotshot crews worked overnight and are expected to spend at least the next couple of days mopping up the fire. Firefighters won't leave until all the hot spots are gone, said Saarloos. Part of that work involves "gridding," with firefighters walking the burn scar in a line to ensure no smoke or heat remains. "There will be 100 percent mop-up and it will be 100 percent cold before firefighters come off that fire," she said. The fire scorched woods but did not burn any homes or other structures and caused no evacuations. It got within about 1,000 feet of a cabin and power lines but did not burn them, Saarloos said on Friday. From a hill in an Eagle River neighborhood Friday evening, some neighbors gathered to talk and take photos of the planes flying overhead. 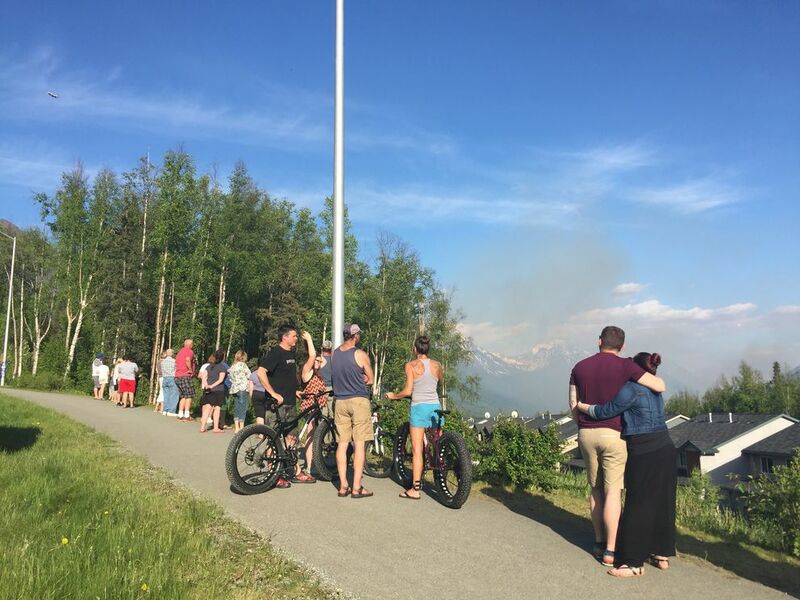 Two planes and a helicopter responded to the fire, which was first reported around 5:30 p.m. as a column of smoke on the south side of Eagle River. On the ground, the two hotshot crews hiked into the area where the fire burned in mixed spruce. They found a pond and set up hoses, Saarloos said. "That was really the one-two punch to get a handle on the Hiland fire," she said. The Anchorage Fire Department also helped fight the fire and the Anchorage Police Department helped with traffic, Saarloos said. The Division of Forestry began investigating the fire on Friday. The investigator will return Saturday to continue his investigation. Saarloos said this year people have been excellent about reporting any sign of smoke. But for some reason, the smoke call from observers seemed to come later than normal, especially for such a well-used area. By the time officials were on the scene, the fire had already grown to more than two acres with a "fair amount of smoke." "This fire had already gained some ground before we were notified," she said. "That was surprising for such a well-used, populated area." There was no lightning in the area Friday, leaving fire officials confident humans are to blame, she said. On Friday, winds were blowing a light 2-3 mph, with gusts up to 5 mph, helping to prevent the fire from spreading and allowing aircraft to quickly attack the flames. Saturday morning, some light smoke drifted over the cool valley. "You can smell some smoke but barely see it," said Saarloos. Tim Mowry, a Forestry information officer in Fairbanks, said temperatures are rising in the Interior after a stretch of cool, wet weather. But the weather is expected to warm, rising into the 80s this week and increasing the fire danger around the state. For now, most eyes are on the Southcentral region, where temperatures have steadily been high. The division has issued a burn suspension for the Mat-Su. The suspension "prohibits permitted debris burning and the use of burn barrels in that area, but that is currently the only burn restriction in effect for the state," the division said in a Facebook post. Campfires must be 3 feet in diameter or smaller. Saarloos said firefighters were busy in the Matanuska-Susitna valley area on Saturday, where winds were picking up in the afternoon. Firefighters were responding to smoke calls and concerns that some people are conducting burns that currently aren't permitted. "With the wind conditions and human activity, there's still a lot of potential" for wildland fires to be a problem, she said. People can have campfires as well as warming and cooking fires, she said, but if the wind picks up to 10 mph, campfires need to be put out. 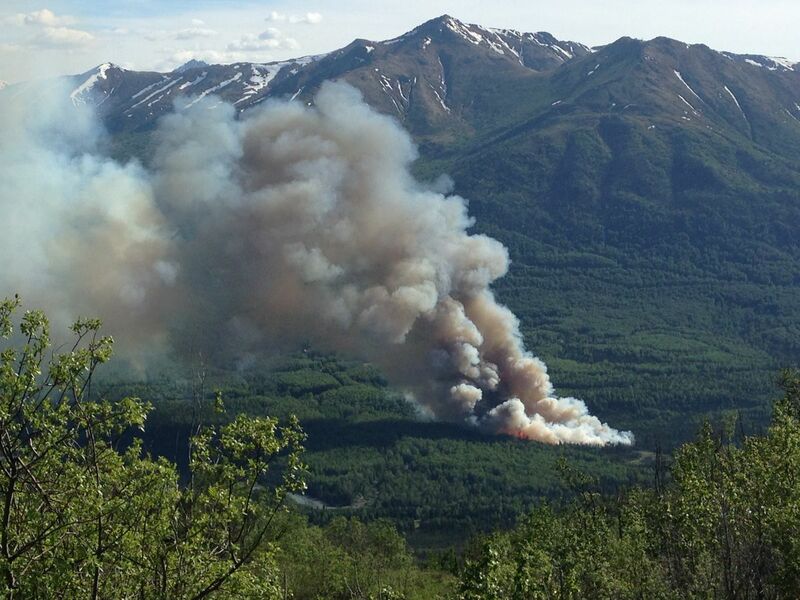 A recent 2-acre wildfire in Anchorage is also presumed to have been human-caused because no lightning was in the area when the fire happened, officials have said. The fire in the heart of Anchorage's Campbell Creek Greenbelt on May 14 may have begun at a homeless camp in the area, fire officials have said. "There's speculation and different hypotheses it might be a homeless camp, but it's under investigation," said Saarloos.